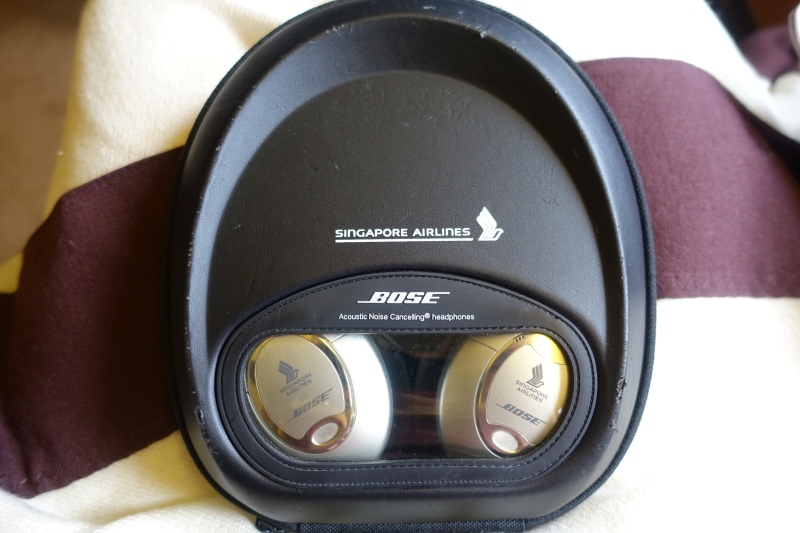 This Singapore Airlines First Class 777-300ER Review is based on our Singapore First Class flight from Moscow DME to Houston IAH, a route that is being changed to Manchester, UK to Houston. This is Singapore's old 777-300ER with 8 first class seats. Visiting Russia? See all of our posts tagged Russia. The Singapore Airlines First Class cabin on the 777-300ER has 8 seats, four in two rows in a 1-2-1 configuration in each row. While the couple’s seats are in the center, if one of you wants a window, as my son did, you can sit in window seats one behind the other. 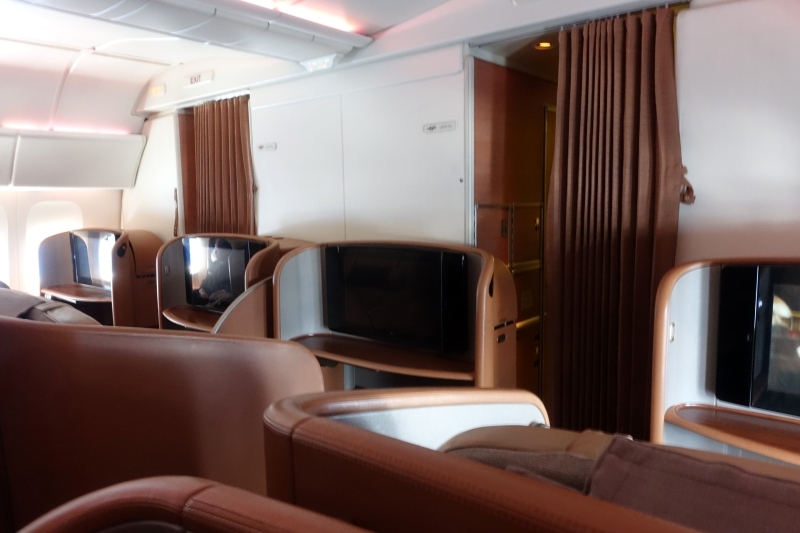 The nice thing is that often Sinapore Airlines' older 777 first class cabins are not full, so if anything, there's a more private feel to them than to Singapore Suites on the A380, where most of the seats can be full. And there are two lavatories for the 8 seats, so it's almost as good as Cathay Pacific First Class, with almost never a wait to use a lavatory. 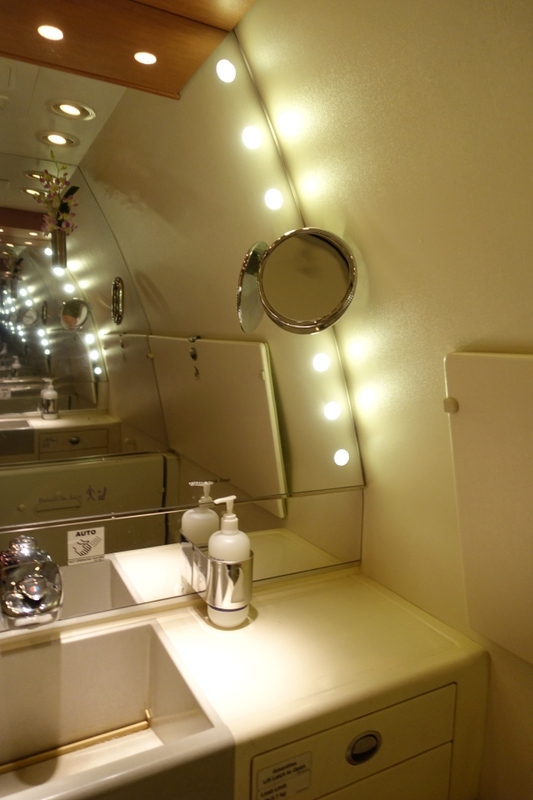 The Singapore First Class Bathrooms on the 777 are standard size, so don't expect the large shower suite you find in Emirates First Class, or even the roomy bathroom on Thai Airways A380. But at least on our flights, they are kept impeccably clean, and with two bathrooms for at most 8 passengers, you're unlikely to have to wait or wait long for one. I also liked that there were fresh orchids, adding a touch of elegance. Singapore's old 777-300ER old first class seats are looking a bit worn these days, but they're still a roomy 35 inches in width, and of course recline to fully flat. These are open suites, no closing doors, but due to the fewer seats than in Singapore Suites and less likelihood of a packed cabin, it can actually feel nearly as private as Singapore Suites. 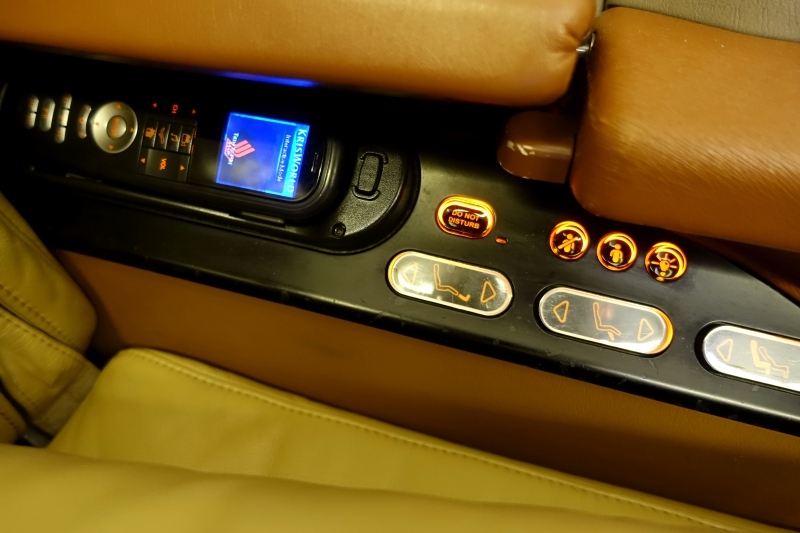 Since even (or especially) the most elaborate high-tech interfaces can encounter glitches, I'm happy to have manual seat controls in the armrest, along with a light control and the KrisWorld IFE remote. 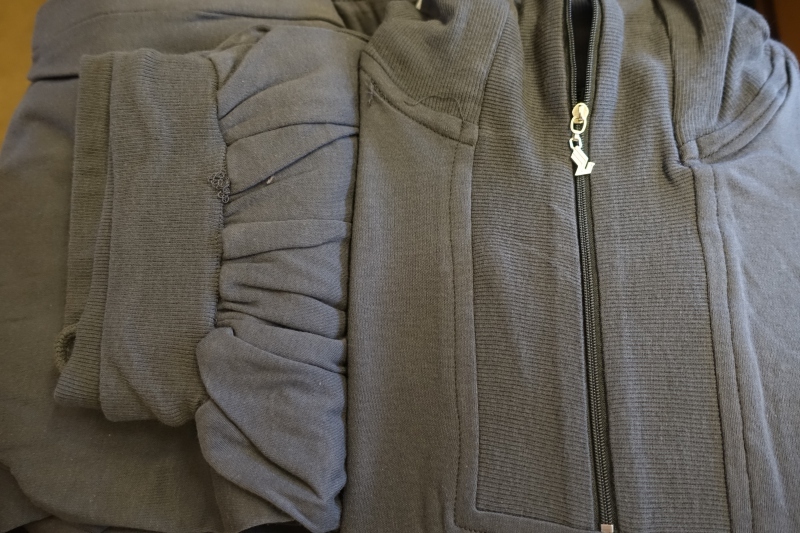 Singapore pajamas are grey and nothing much to look at, but are soft and comfortable. For some reason the legs of the pajamas (at least the women's pajamas) always run a bit on the short side. 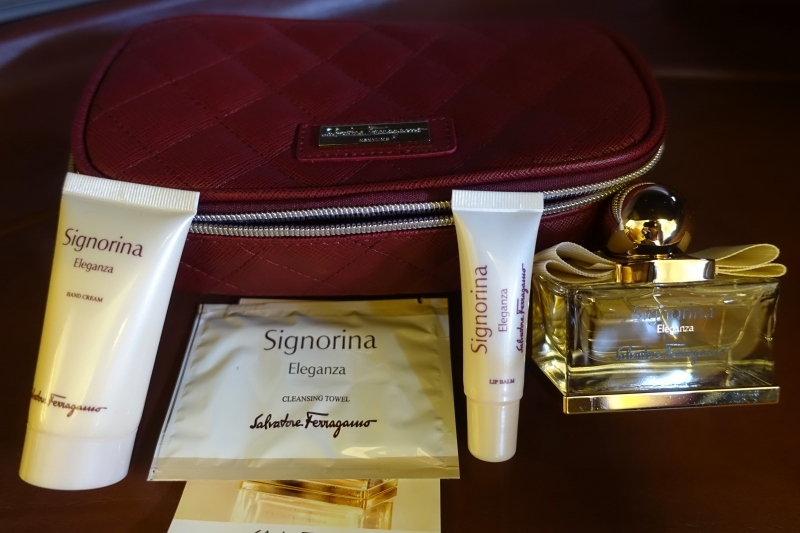 The current women's amenity kit is Salvatore Ferragamo's Signorina Eleganza. While it looks great, and I'm certainly a fan of the Ferragamo family's luxury hotels, the Portrait Roma and Portrait Firenze, as a non perfume wearer I don't find this kit nearly as useful as the Kiehl's amenity kit Singapore First Class once used to offer. 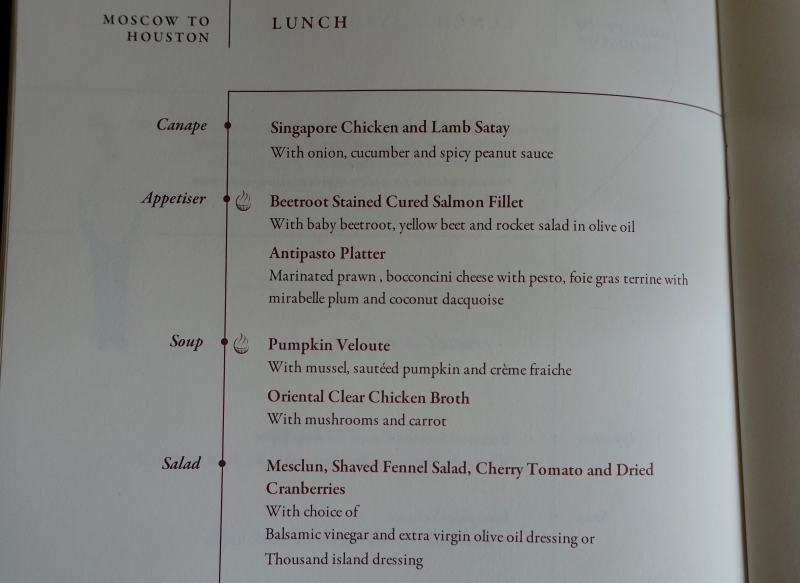 Menus were already at our seats, and the variety of choices helped compensate for the fact that Book the Cook is not available from Moscow (perhaps it will ultimately be available from Manchester, although it currently isn't). 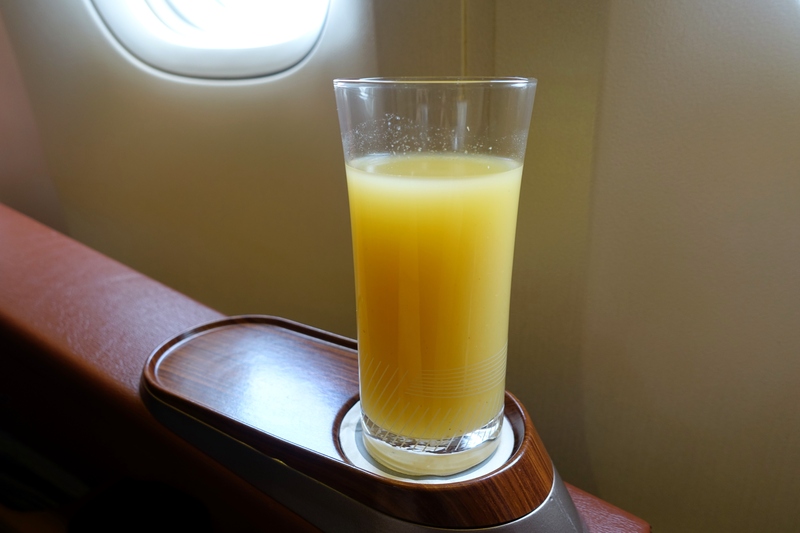 A source of pride for Singapore Airlines is that First and Suites passengers are offered a choice of either Dom Perignon or Krug (usually first class offers at most one of these brands, or another champagne entirely). 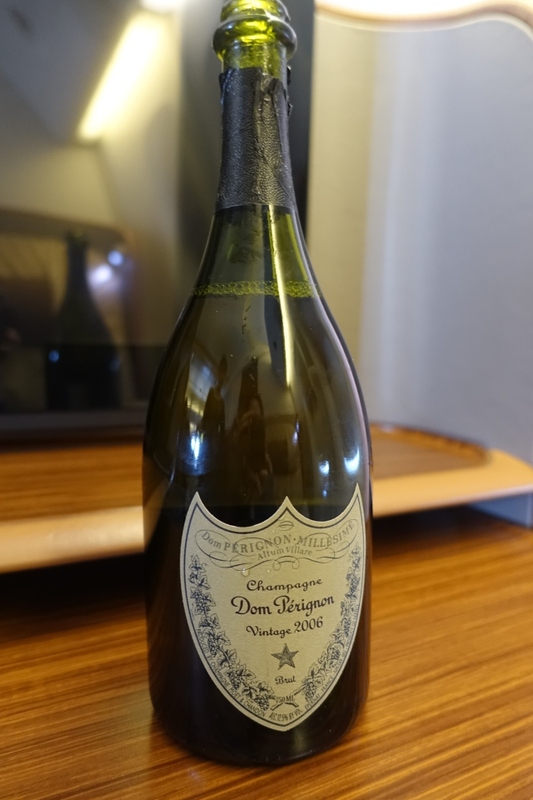 I'm definitely not a champagne connoisseur, but it did go extremely well with the chicken and beef satay with peanut sauce that is a signature nibble in Singapore First Class and Singapore Suites. And don't worry, the bottle is there just for the photo; I had a single glass. 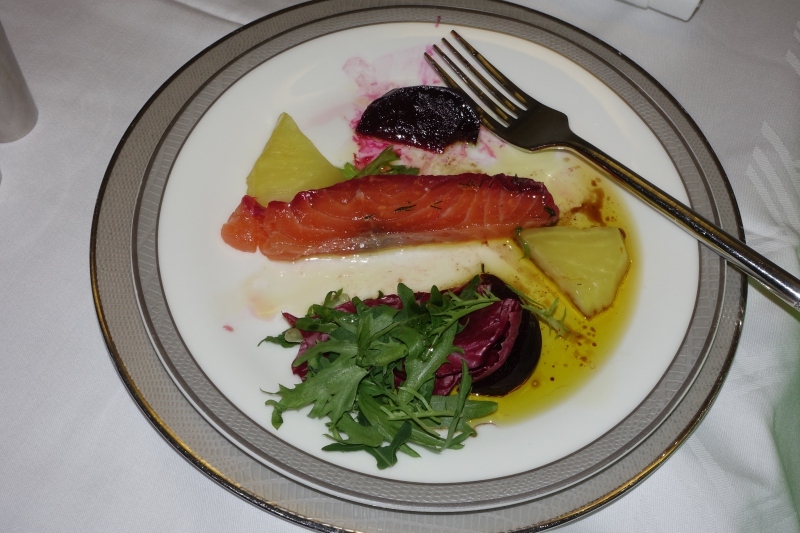 My son enjoyed his cured salmon appetizer, even though he left the beets for me to eat. 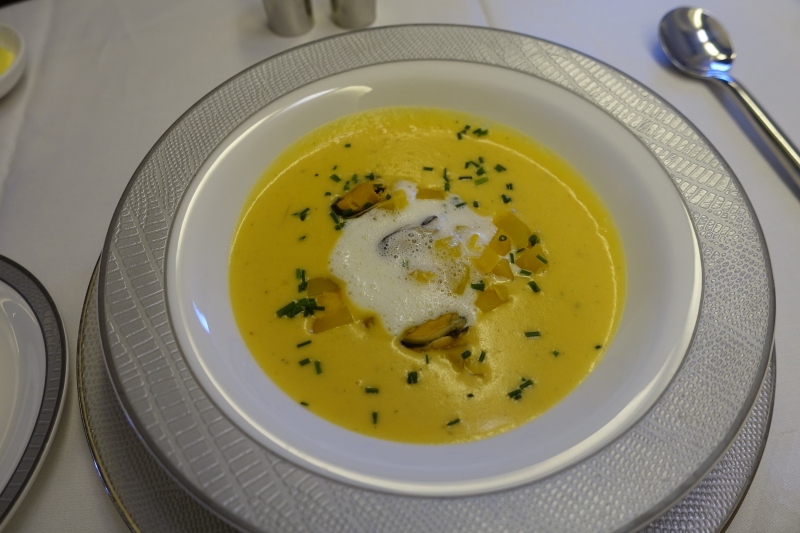 I was going to skip the soup, but I love pumpkin soup, and was glad I tried Singapore Airlines' version, enriched with mussels and creme fraiche. 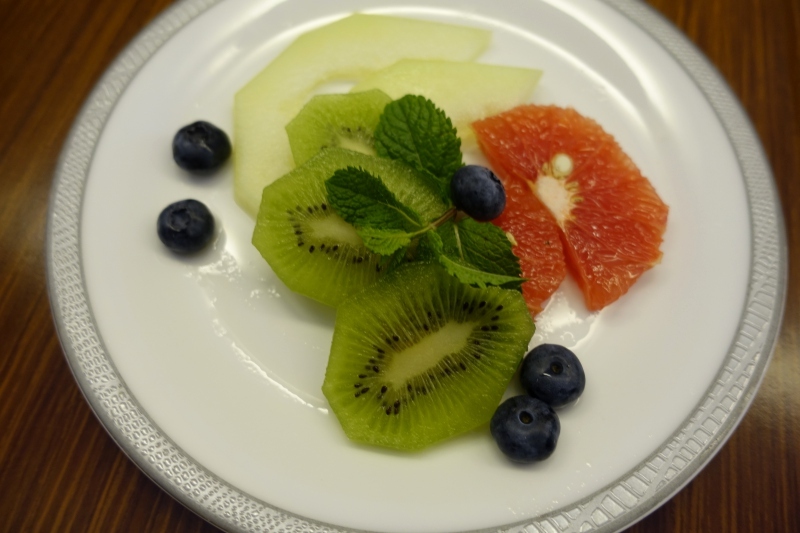 This plus an appetizer would have made an excellent light meal if you didn't feel up for any of the main courses. 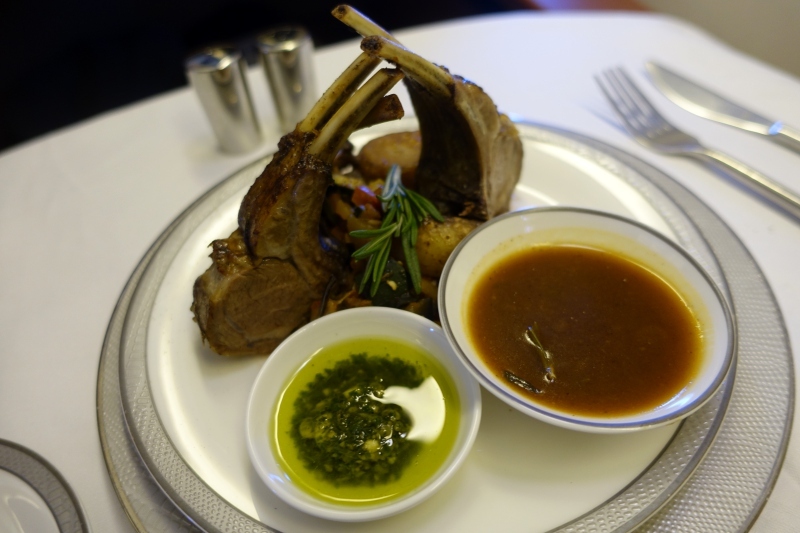 For my main, the lamb was tasty, but a bit chewy. It can be difficult to get the texture of meat or fish right when reheating it on flights, and generally stews or braised dishes work much better. 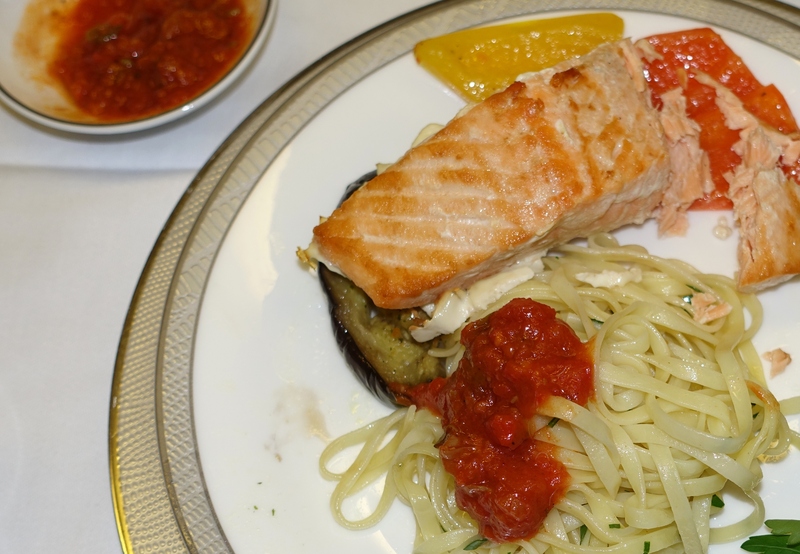 My son tried the pan seared salmon fillet with tomato caper sauce and fettucine, and had already eaten some before I managed to get over and take this photo, so keep in mind the presentation was nicer than it appears. 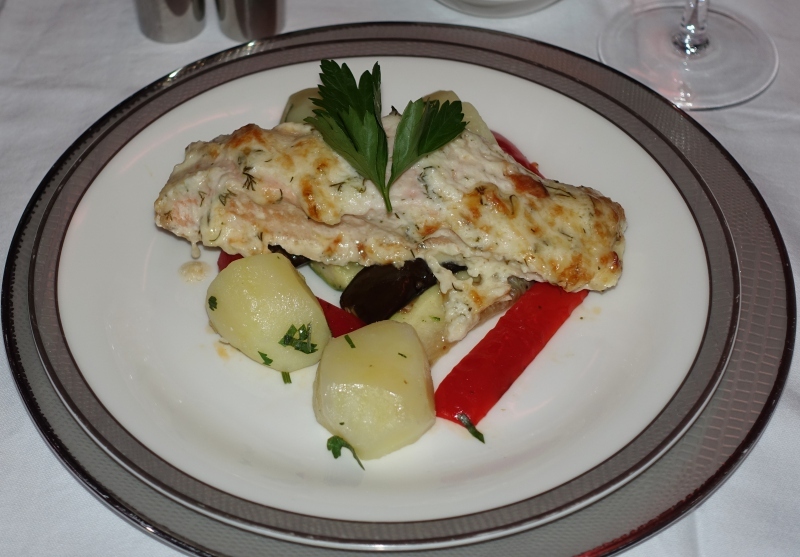 As usual on flights, I found the fish slightly overcooked, but at least salmon tolerates this a bit better than some other fish. 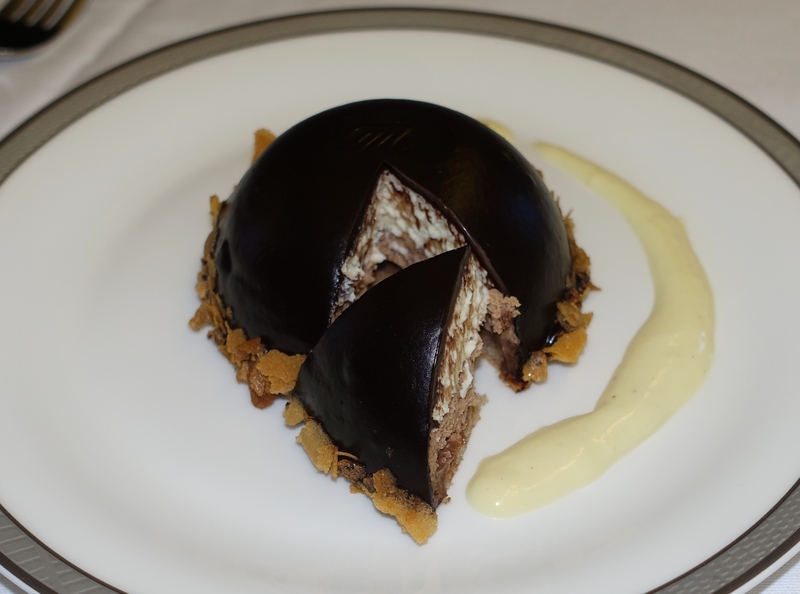 For dessert, I tried the Chocolate Delice, with caramel truffle chocolate mousse. 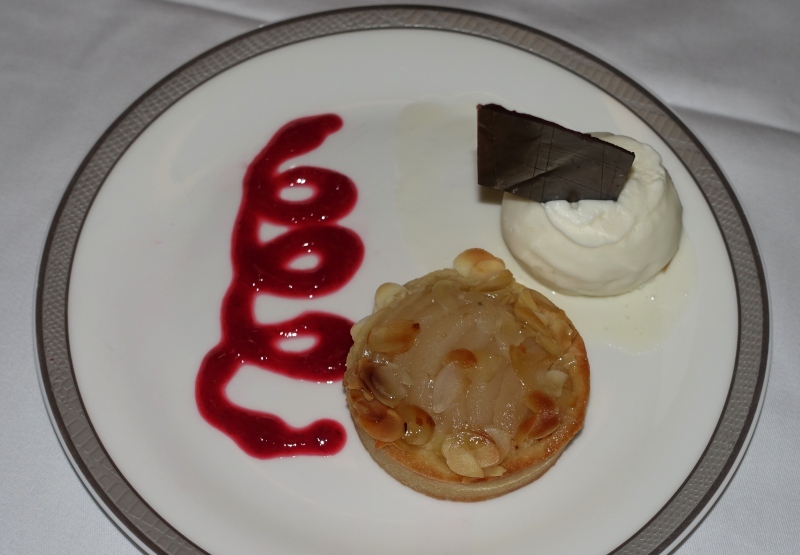 It was a very good dessert–better than more than half the first class desserts I've tried, but not among the very best. I got some sleep (more on that below), did some work, and a couple hours before landing in Houston, had a light meal. 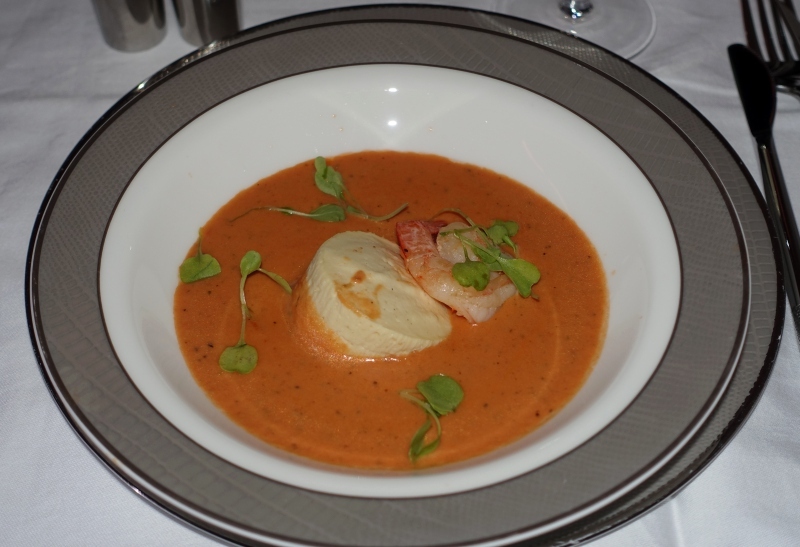 The highlight was the soup, a fantastic creamy tomato soup with cauliflower custard and masala spiced prawn. 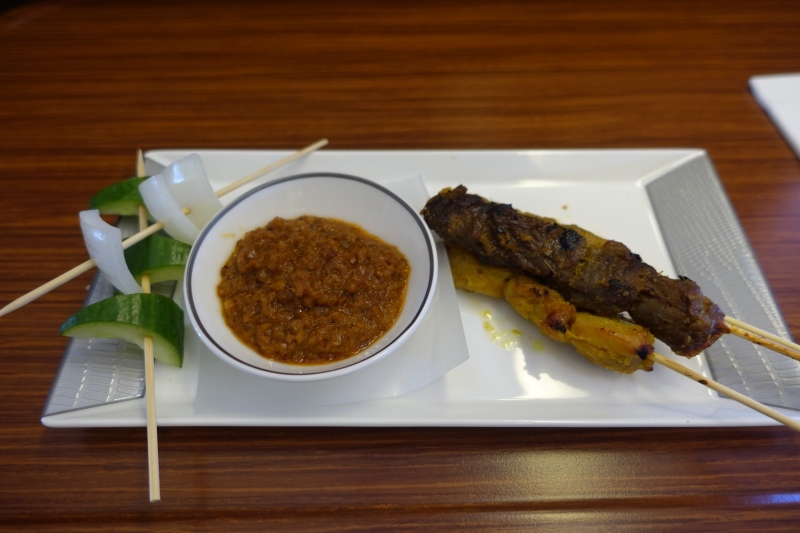 It was my favorite dish of the flight, or at least of the changing menu items, since I do really like the satay with peanut sauce that is on every flight. For the main I didn't want any more meat, nor do I like chicken congee, the other two choices, so that left the Baked Cheese Herb Crusted Salmon Fillet. I still think it was best given what I felt in the mood for, but it was quite lackluster, and of course overcooked. 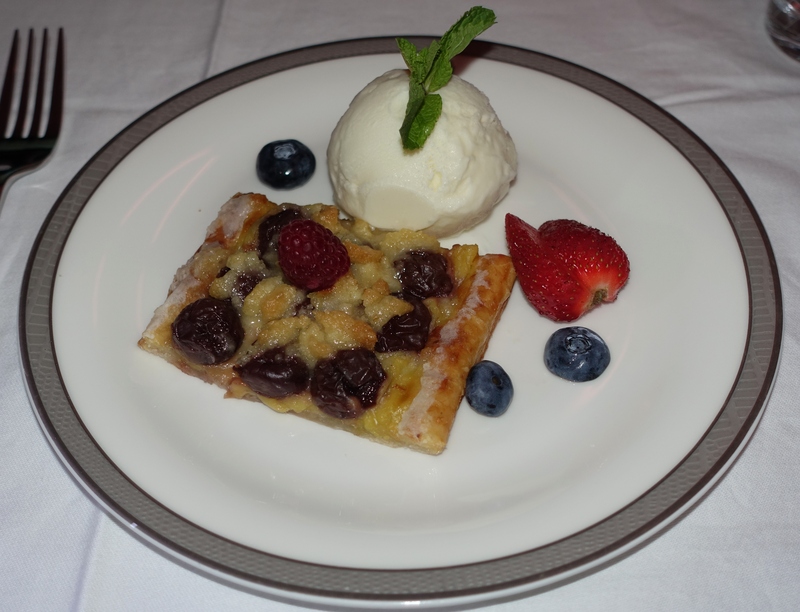 More and more I prefer fruit desserts, so I actually liked the Warm Cherry Streusel Cake with Vanilla Ice Cream better than the Chocolate Delice I'd sampled earlier. 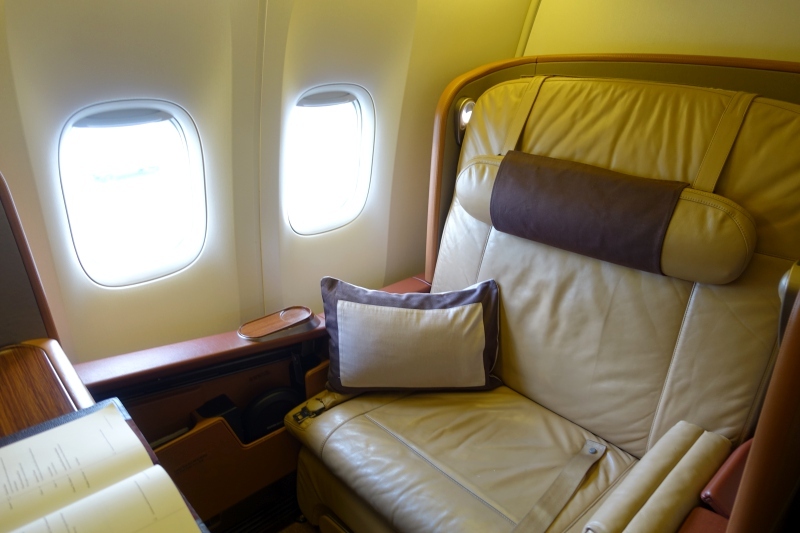 One thing I definitely miss in Singapore Airlines old First Class on the 777 is that, unlike in Singapore Suites, there's no memory foam-like mattress pad, and the seat simply reclines into a bed. In Singapore Suites, the bed is designed to be a bed, so it's not the same seat surface. 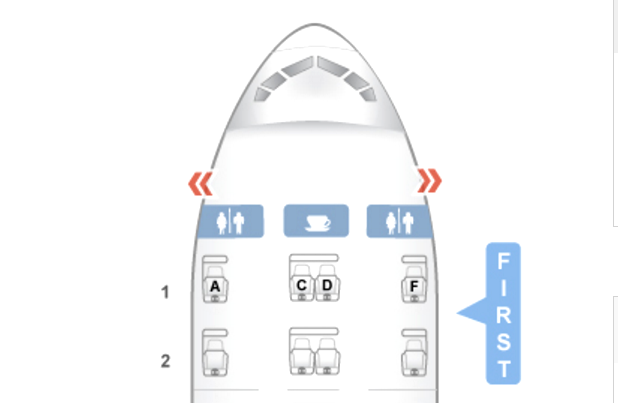 The minus of that approach is that it does require cabin crew to make your seat into a bed. 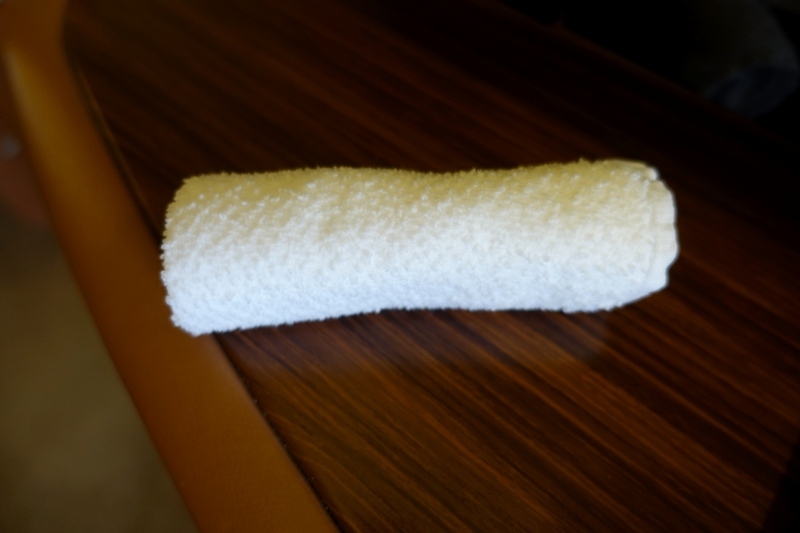 Even with Singapore Airlines First Class on the 777, it's best if you allow the crew to do turn down service, since there is a mattress pad and duvet, it's just that the mattress pad is a relatively thin mattress pad, similar to what you'll find in most airline first class products. 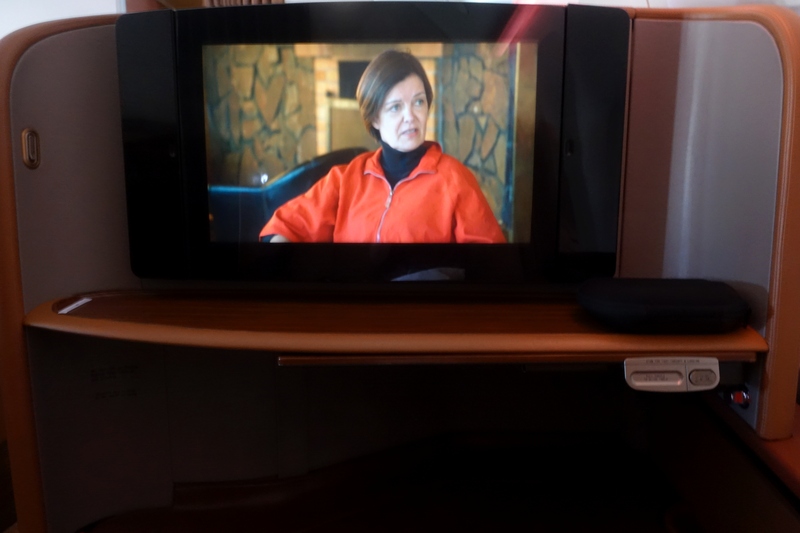 It's not a differentiating factor, the way it is for Singapore Suites and JAL First Class / JAL Business Class. 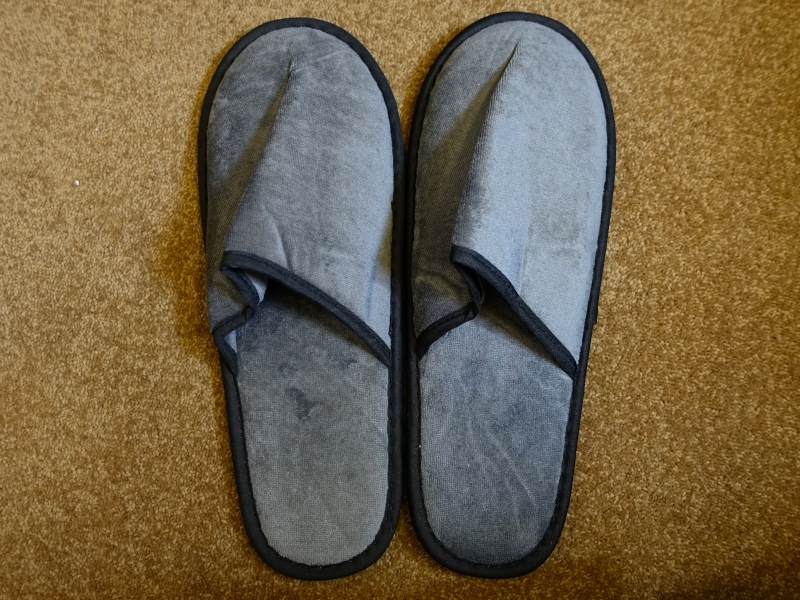 Because of this, I called into Singapore Airlines to see if it might be possible to carry one or two of the Singapore Suites mattress pads on our flight, but as I expected, it wasn't possible. Instead though, the cabin crew graciously agreed to give us each two mattress pads, since there were extra ones from the other empty seats. That definitely helped make it more comfortable, although of course not Singapore Suites comfortable. Thanks to the two mattress pads and a sleep aid, I slept about 4-5 hours, which is good for me on a flight. Singapore Airlines' IFE system, KrisWorld, is so good that I keep the KrisWorld guide for movie ideas for my husband and me. I love that it unearths many foreign films that I'd otherwise not know about, as well as carrying films that have been on my list to see. In the former category was Bolshoi Babylon, a documentary about the crisis affecting the Bolshoi Ballet after its director, Sergei Filin, had acid thrown in his face. I found it enthralling, and it was a good chance to hear Russian again on our way back from 3 weeks in the country. In the latter category, of films I'd been meaning to see, was Michael Moore's “Where to Invade Next.” Enjoyable to watch Moore's film making, although of course the subject matter is hardly complimentary to the current state of affairs in the U.S., tackling everything from the U.S. for profit prison system to school lunches to women (or lack thereof) on company boards, to paid vacation days. We redeemed 57,375 KrisFlyer miles per person for our Singapore First Class award from Moscow to Houston, which you can easily earn most of with the 100K Chase Sapphire Reserve offer, especially if you put the $4000 minimum spend towards travel or dining, which earn 3X Ultimate Rewards points per dollar. Ultimate Rewards points transfer 1:1 to Singapore KrisFlyer miles. The new Manchester-Houston flight also costs the same per person for first class awards. Singapore Airlines in the process of retrofitting its 777-300ER fleet, but there are still flights such as the Moscow-Houston route (changing to Manchester-Houston 10/30/16) on the old aircraft. 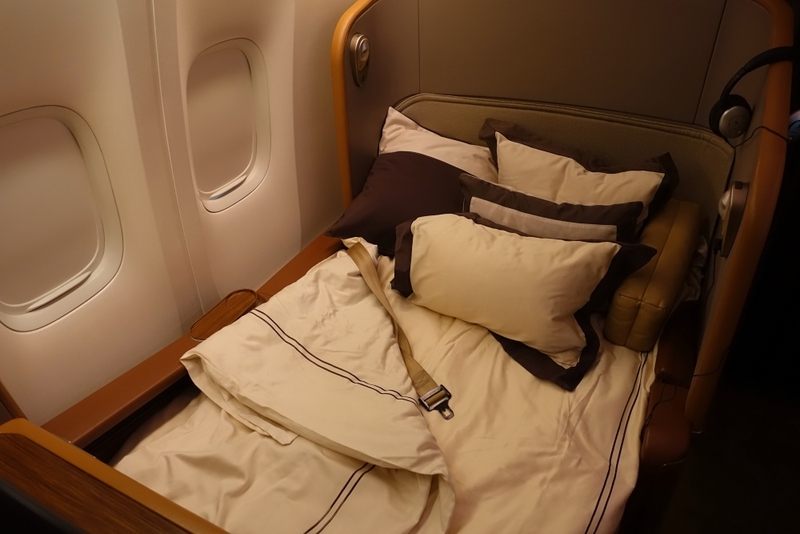 While it certainly lacks the wow factor of the A380 Singapore Suites, it's still a very comfortable first class product, particularly if the cabin isn't full and you can snag an extra mattress pad for the bed. 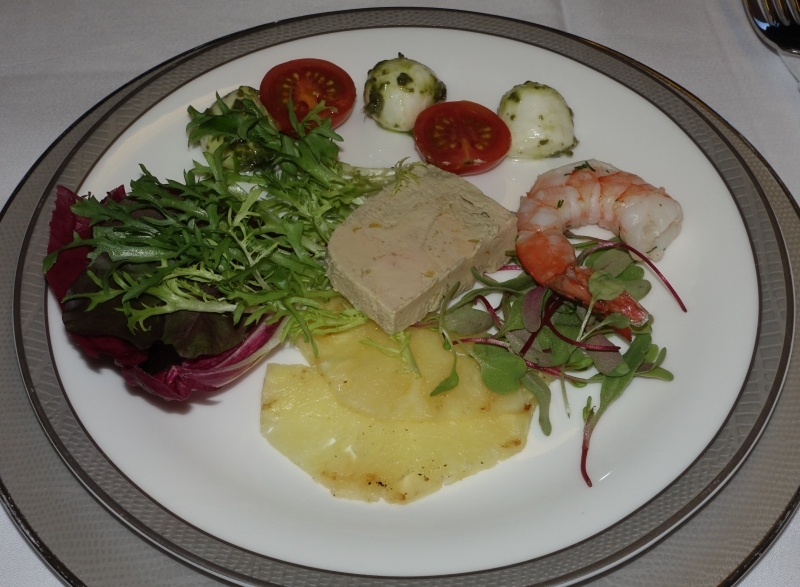 The strongest points of Singapore Airlines are the consistently great service (Singapore Airlines trains its cabin crews longer and more rigorously than most other airlines), nice wide seats, excellent KrisWorld entertainment system, champagne (Dom or Krug) and usually, the appetizers. 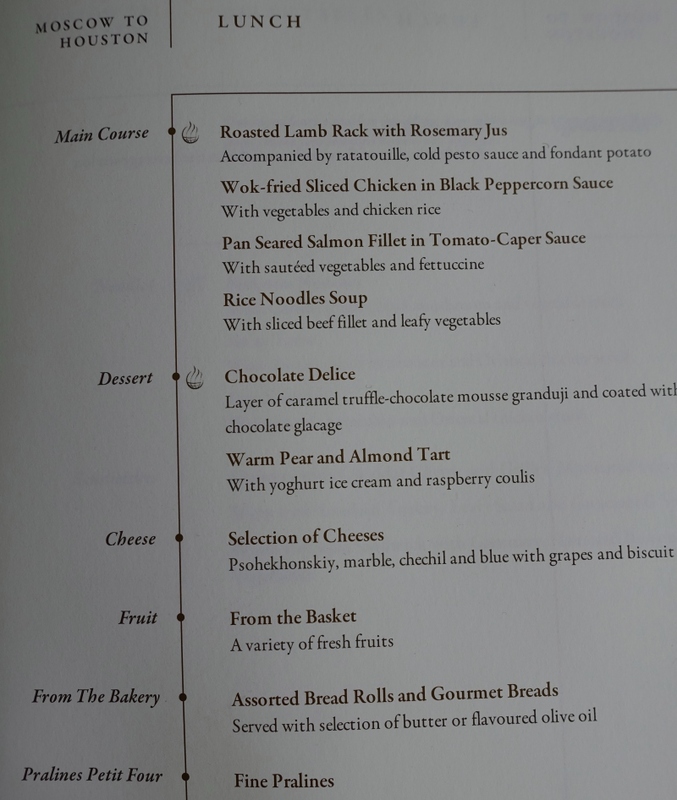 Weaker aspects are the main courses, especially on flights that don't offer Book the Cook meal pre-ordering and the ground service, since there's no chauffeur service offered anywhere, and the Singapore Private Room in Singapore does not offer sleeping rooms or any spa or massage service. 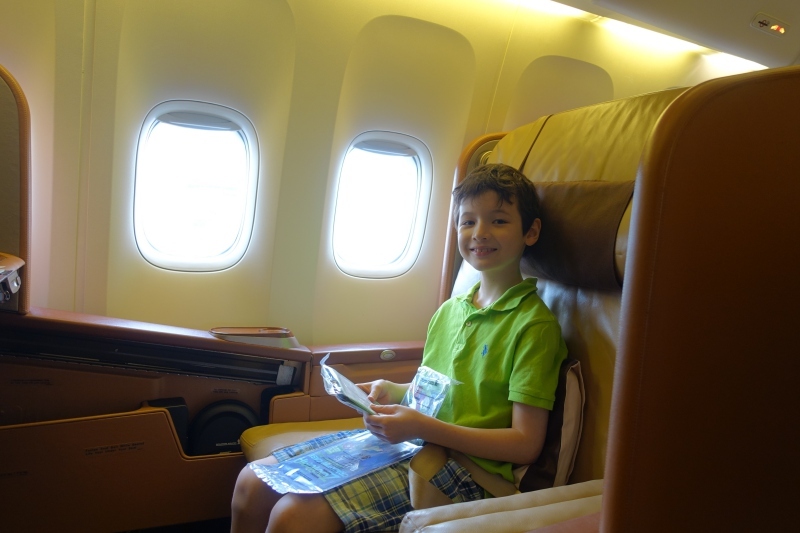 If you've flown Singapore First Class on the 777-300ER recently, what was your experience? 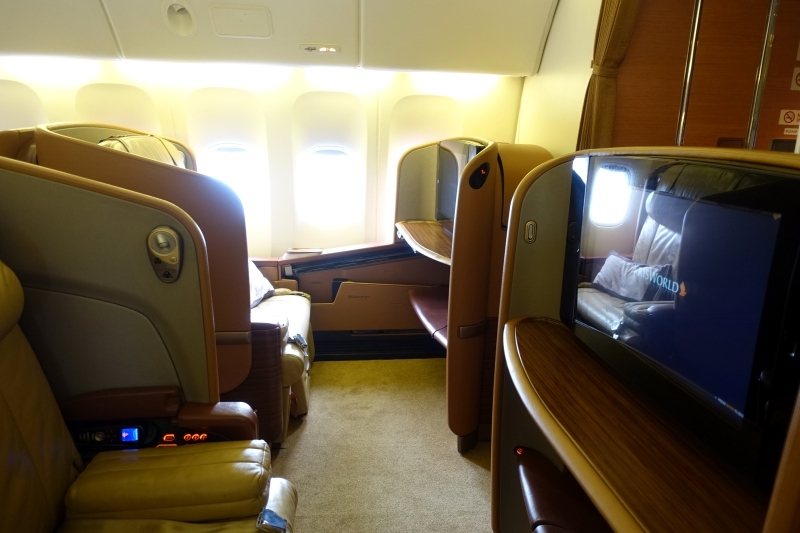 Singapore Airlines: Best Award Redemptions from the West Coast to Asia?